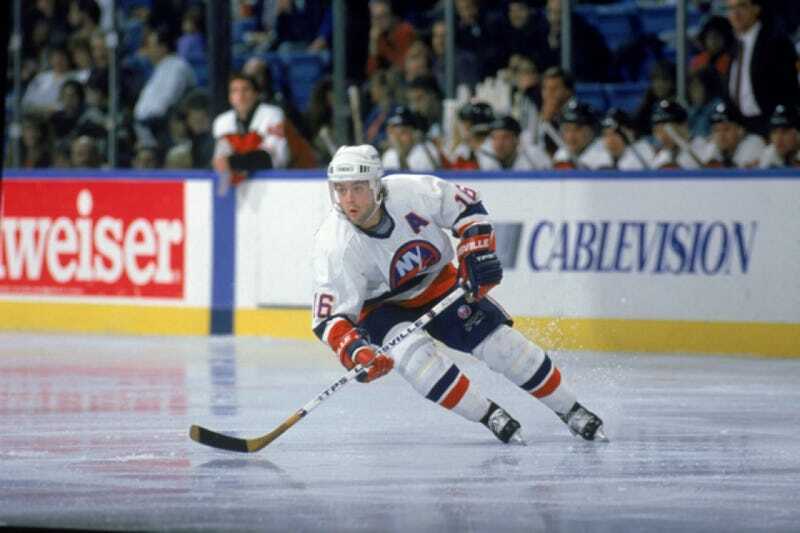 Pat LaFontaine played eight seasons for the New York Islanders just after their run of four consecutive Stanley Cups from 1980-83. He was a fan favorite. His Game 7 playoff goal to beat the Capitals in 1987's "Easter Epic" is one of the most famous in league history. So why, according to a story in today's Wall Street Journal, are the Islanders doing all they can to pretend LaFontaine's time with the team never happened? The Isles are showing a video before every home game this season to commemorate their 40th anniversary; it includes no highlights of LaFontaine. Keepsake tickets for all 42 home games are emblazoned with the image of notable Islanders players through the years; LaFontaine's is noticeably absent. And when LaFontaine and former Islander Steve Webb biked from Toronto to New York in September to raise money for charity, the team's press release made no mention of LaFontaine, who continues to make his home on Long Island. Odd, no? The dissonance seems to be the result of what happened in the summer of 2006, when LaFontaine was hired as an unpaid senior adviser but resigned after just 40 days because owner Charles Wang fired general manager Neil Smith, who had been hired on the same day as LaFontaine. LaFontaine elected to step down after failing to persuade Wang to reconsider, he said-not necessarily out of loyalty to Smith, but out of concern for the franchise's direction. "I believe you treat people fairly," he said, "and stand up for what you believe in." "Pat ran for the hills. Pat ran for cover," said Milbury, now an NHL analyst for NBC. "It was cowardly, and it was terrible. And if Charles was [ticked], I wouldn't blame him in the least." So what direction have the Islanders gone since LaFontaine left? They're about to wrap up their fifth straight season with a last-place finish, and they're next-to-last in the NHL in home attendance. Their treatment of LaFontaine seems to be a pretty good indication of how they operate.